I haven’t taken the Apple TV plunge, but I do stream video to my big-screen TV from my Macintosh. No, I don’t have it connected directly—I use my PlayStation 3 to bridge a connection between the Mac and the TV wirelessly. My secret is a cool piece of utility software called MediaLink, from Nullriver Software. Nullriver developed Connect360 ( ) to do the same thing with the Xbox 360, so it was only a matter of time before the company offered similar functionality for the PS3. As it turns out, it’s a different set of problems requiring a different solution, however. In developing the PS3, Sony decided to embrace an open standard called Universal Plug and Play (UPnP). The PS3 is capable of locating and connecting to UPnP servers it finds on the same network—accessing the PS3’s main interface, the Cross Media Bar (XMB for short), you may have noticed entries like “Photos,” “Music” and “Video.” Underneath each of them is an option called “Search for Media Servers.” This is what the PS3 is doing when you select that option. MediaLink makes sharing your audio, video and photos with a PlayStation 3 a one-click process. MediaLink is installed as a system preference, and it has a very simple, very streamlined interface. A single button enables you to start or stop the software, and when it’s active, it appears in your menu bar. The software has four options, including playing a sound when a new UPnP device is discovered and entering a debug mode; otherwise, the only thing you’re telling it to do is to publish the directories you want to share with your PS3. 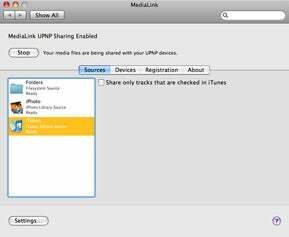 You have one other option—you can tell MediaLink only to share files you’ve checked in iTunes. From the PS3’s perspective, accessing files over the network is equally simple. Once MediaLink is publishing your directories, they’re visible to the PS3. Then all you have to do is drill down to access the files. Changes to your iTunes playlists are picked up quickly—usually within a few seconds of making them—and you’re able to share any files in MP3, AAC, WMA, or WAV format as long as they don’t use copy protection. This is one big benefit of the Apple TV over solutions like MediaLink—files you’ve bought from the iTunes Store won’t be playable unless they’re in iTunes Plus format, which eschews copy protection. It’ll even show off album art. AAC is a recent enhancement to this only-recently released utility—the 1.2 release of MediaLink, which is what I tested, is capable of streaming AAC audio files. That’s great for me, as I converted over the bulk of my library quite some time ago. The software enables you to stream just about any file format the PS3 can understand, so you can also show MPEG1, MPEG2 and MPEG4 video, H.264 (again, without DRM), AVI files, WMV and ASF, and JPEG, GIF, PNG, TIFF, BMP, and other image formats. The software also works with the PlayStation Portable (PSP) thanks to a nifty feature built in to the PS3 called “Remote Play.” Once this is activated, you can view video files stored on your Mac on your PSP without having to cart them over on a Memory Stick Pro Duo card first. I had been using the equally excellent Connect360 to stream media to my Xbox 360, and I discovered when I installed MediaLink that the two don’t play well together—they both try to use the same TCP/IP ports to broadcast information. So it’s an either-or proposition if you’re lucky enough to have both consoles in your house. Like Connect360, Nullriver’s support for MediaLink is done through a simple Web page FAQ, and pushes you to e-mail for further questions. I wish Nullriver would put together a discussion forum, even if it was just user-driven. I’m sure people have questions or comments they’d like to share with each other. I’ve dabbled a bit with other UPnP server software for the Mac—in fact, I blogged about this several months ago— and I’ve come up short. So I’ve been delighted with MediaLink’s rock-solid stability and incredible ease of use. But don’t take my word for it—download the software and try it out as a 30-minute demo. MediaLink works quite well, and AAC streaming is a welcome addition to the software. It looks a bit bare in spots, but if you want to stream video, photos, or audio from your Mac to your home entertainment center via a PS3 or other UPnP-equipped hardware, you should give it a try.